Hi, everyone!! 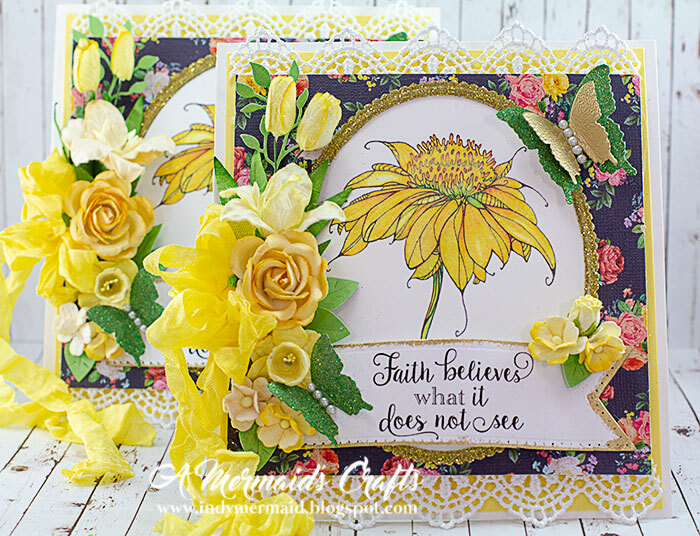 Lisa here to share a card with you today featuring the newly released Aster Garden Digital stamp set. Please click on my blog, A Mermaid's Crafts, for complete details on how this card was created. Be sure to leave a comment both here on this SNS blog post and then head on over to my personal blog and leave a comment there as well for your chance to win a $20 gift card to SNS!! One lucky winner will be chosen from one of the Designers' posts on the last day of each month. A comment must be left on both the SNS Blog and the Designer's post in order to qualify. The winner will be announced on the 3rd of the following month, both on the SNS Blog and on the SNS Facebook page. You sure went all out to create such a gorgeous card; it must have taken a lot of time to plan the result. It really takes one’s breath away to take in and appreciate all those flowers, ribbon, die cut, patterned paper background, butterflies, and saying. I also love your touches of gold on it and the saying certainly stands out and fits in beautifully; what it says is so true. Gorgeous Card!! Ooh, WOW Lisa! What a stunner! I LOVE the flower image and your beautiful coloring…. the sentiment is beautiful and I love the “extras” you added to make the whole card POP!! Have a great day!